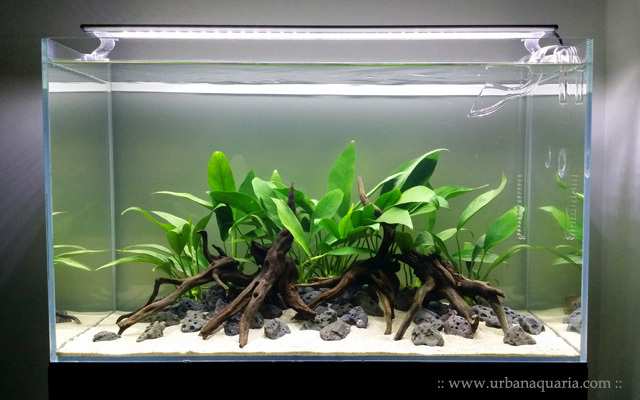 I recently decided to re-scape my 64 litre tank into an ultra-low maintenance aquascape. It is based on just sand substrate, rock and wood hardscape, and hardy plants tied to objects. This setup will still retain the use of Co2 injection to support the plant growth. 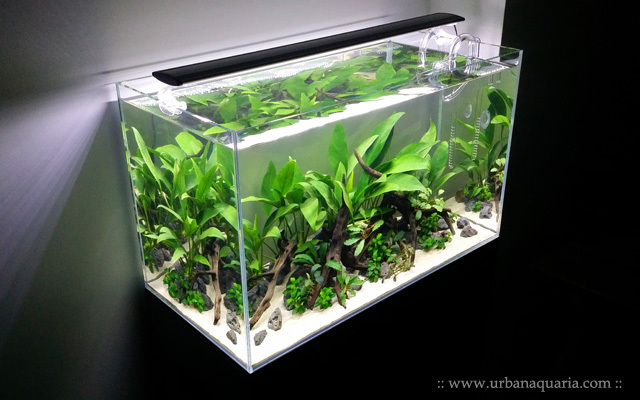 The main objective of this aquascape is quick setup and easy adjustment of the layout without mess or hassle. The selected slower growing plants require alot less maintenance too. In addition, the tank will also be used to grow out various plants for transfer to larger tanks in the near future. I started by filling the tank with a small mound of sand in the back and middle, keeping the layers thin at the front. 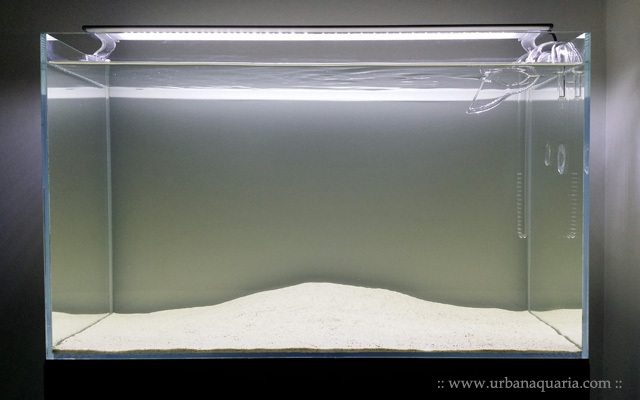 The benefit of using sand substrate is the ability to aquascape with the tank filled with water, and it stays clear throughout without the usual mess and cloudiness associated with soil substrates. Next i placed piles of small volcanic rocks across the sand substrate with paths between them. This is followed up by the addition of branchy driftwood to simulate some random root-like structures around the rocks, along with Anubias sp. Angustifolia as the initial background plants. Bunches of smaller Anubias sp. 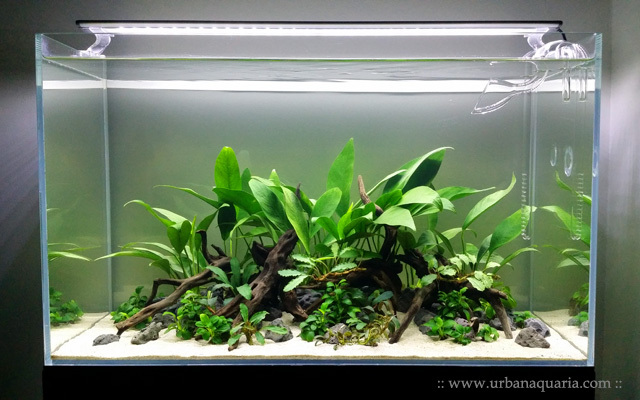 "Petite" and various Bucephalandra sp. are added to help fill in the gaps and create accents around the hardscape. And its done... the entire layout was completed in less than 30 minutes. Quick and simple. The tank's canister filter was allowed to run for a few hours, then livestock from the previous setup were acclimatized and added back into the tank (no issues with ammonia spikes or tank re-cycle due to the use of inert sand substrate). Love how simple this scape is. I see you used reef sand, I guess it has no effect on plants and freshwater fauna? For the Sudo Reef Sand that i've used, it didn't have any significant measurable effect on the water parameters so far, hence no issues encountered with the plants and livestock. The tank inhabitants are also the hardy types, so they are able to adapt to different water parameters quite easily. Note that i used relatively low amounts of sand (only around 2+ liters worth) versus the water volume, so that's probably one of the factors too. If you have sensitive flora or fauna that require specific water conditions (ie. lower pH), then you'll probably need to look at other additional methods to adjust the parameters to suit them. Great setup. Where did you purchase the sudo reef sand? I bought the Sudo Reef Sand from Seaview Aquarium... i've also seen them in stock at places like East Ocean Aquatic and C328 too. Can check at those LFS. Long time since an update on your blog. Any updates on your tanks ? Been following your blog for sometime and get quite excited when you post new updates. Hi, how do you hold up the small mound of sands in the middle? Mine tends to flatten after some time. Thanks! I guess the mound of sand in my setup is being "supported" by the rows of rocks, so that probably helps to keep the sand from flattening out. Hi UA, can I check with you where you bought the Tropica fertilizer? Went to few LFS like Seaview, C328 & Polyart but can't seem to find any product from Tropica. Thanks! I bought mine from C328 last year... i guess its probably sold out there at the moment. You can get the Tropica fertilizers directly from Fishy Business too, they are the local distributors of the Tropica brand products. Nice set-up. Looking forward to more interesting posts. I noticed that you do not have a surface skimmer in your tank. How do you get rid of the surface protein from your tank? Well, i guess i feed my fishes and shrimps very lightly, usually only once every 2-3 days, and the overall bio-load is kept minimal, so that helps to reduce the build up of oil layers on the water surface. I also usually keep the water level just slightly above the lily pipe outflow, so that it generates a mini vortex which pulls down and mixes the water, as well as creating a constant ripple current at the surface. Thanks for sharing the useful tips to minimize protein level. I got them from Clementi Florist & Aquarium (aka C328) and Seaview... they are usually tied to wood or coconut shells and packed in plastic packs. one more thing, where can I get the driftwood branches? I tried Nanyang and their choices are pretty limited. Tks. You'll have to shop around the various LFS to find nice branchy wood pieces... places that specialize in aquascaping like Green Chapter, Fishy Business, East Ocean, Aquarist Avenue etc have a wide selection of different types of wood. I would like to check if you only use Seachem Matrix as filter media? How many liters do you need to fill in Eheim Ecco Pro 300? Thanks. Yes, if i remember correctly i used around 3L of Seachem Matrix for the Eheim Ecco Pro 300 (instead of the original stock eheim media). Do you superglue all of your plants to pebbles and drop them where you like? Or do you plant the roots in the sand? Anyways, by securing the plants on rocks and pebbles, i can re-position and shift them plants around easily, very useful when doing tank cleaning or re-scaping. My sand substrate is relatively thin, so i simply place the plants and their pebble/rock bases sitting partially in the sand. Over a period of time, the plants will eventually grow longer roots into the sand on their own. What's the watt of your lighting? Do u dose any other supplements other then the plant fertilizer? The Up Aqua Z-Series LED lights i'm using is the 1st generation version with 0.06W LEDs and its total wattage works out to only around 15+ watts. 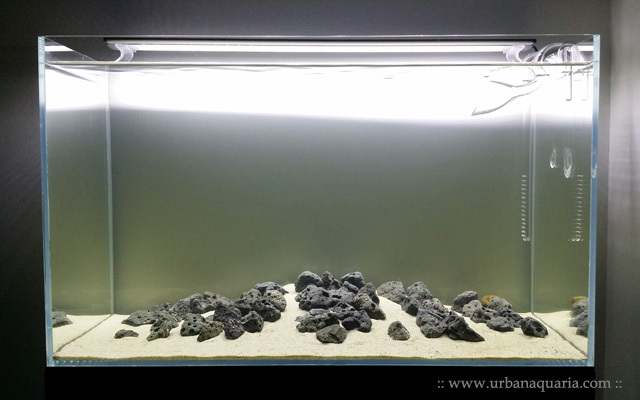 I guess its considered low light for this tank size, but its more than sufficient for the types of plants i keep. Copyright © Urban Aquaria. All Rights Reserved. Picture Window theme. Theme images by TommyIX. Powered by Blogger.